1.What is this website about and what can I find in it? This website is in french and made in France. It gives hundred of documents, pictures, links, etc. and is connected to the french communists (defending Marxism-Leninism-Maoism). The website is called "Etoile Rouge"... which means "Red Star". And also texts to discuss, screensavers, a small forum for people passing by, etc. 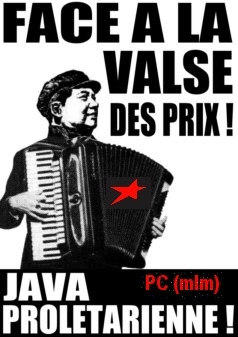 Against the waltz of prices, proletarian java! 2.What is the PC (MLM)? This Communist Party (Marxist-Leninist-Maoist) has the goal to make the socialist revolution in France. It is the organization for socialist revolution in France. Our goal is a society without patriachat, racism and capitalism! The CP(mlm) is still a small organization, even if we are the only real existing MLM organization with a political line and agit/prop. We were founded in 2003, and our direct goal is to make a strong CP(mlm) organized in the whole country through building party committee trough people's resistance. 3.What is the social and political situation in France? What about may 1968? May (for the students) and June (for the workers) 1968 were really important years. But this occasion to rebuild the party (like in Turkey with the TKP(ML), or in India with the CPI(ML) was not used. The marxists-leninists Mao Zedong thoughts stayed on a semi-revisionnist line; the PCMLF became a social-democrat party that disappeared at the beginning of the 1980's. The maoists produced a huge mass resistance, were forbidden by the state, had a great impact and are still quite famous. They were connecting the "anti-authorian youth" with the workes resistance. The factory was the main center for them. But the direction made the "Proletarian Left" (Gauche Prolétarienne) dissolved itself as the "new resistance" was moving in a direction like the italian "red brigades" at the beginning of the 70's. Social-democracy could so take the energy of the masses and wins in 1981. Trotskysm could maintain itself and presents itslef as a real left alternative. For this reason France takes the same road as the others european capitalist countries (i.e. more liberalism, privatization) but the capitalists did not make the big fight against the proletariat (like they did in England for example). So, there are often strikes in the public sector, but the proletariat in the private sector is totally disorganized. In our organisation we are between 20 and 30 years old. We have no historical connection to any ML/MLM movement. We did rebuild it. 4.What is the difference between the ML and the Maoists in the 70's in France? We have in France a real big history in the fact for Maoism. -the one in the French CP made by older people, which built afterwards the PCMLF (ML CP of France) defending Marxism-Leninism Mao Zedong Thought. -the one in the Communist Student Union which created the UJCML (Union of the Communist Youth ML) and then the world famous "Gauche Prolétarienne" (proletarian left) which upholded maoism. The PCMLF followed the chinese three world theories (they defended alliance of France with the "3rd world"), moved near to social-democracy and disappeared at the beginning of the 80's. A small group of the PCMLF upholded Enver Hoxha and formed the PCOF (Workers of France CP), that still exists. The Gauche Prolétarienne existed only from 68 till 1972. They produced a lot of workes fights and clashes with the police, strikes and movements (arab immigrants, for Palestine, "anti-cops workers groups"). The GP, with the paper "La cause du peuple", was helped by Jean-Paul Sartre (that joined the maoists), Beauvoir and a lot of intellectuals. It wanted to make the fusion of the workers movement with the anti-authoritarian youth movement that came out in 1968. The GP was the main treat for the french bourgeoisie. The GP created the "Nouvelle Résistance Populaire", the People New Resistance, which was a guerilla lead by the GP. The GP thought that the model was the resistance against the nazi occupation. But the direction refused to go further in the direction of armed fights and dissolved the movement (which was already forbidden by the state since a long time). The GP then totally disappeared due to internal contradictions, lack of ideology, militarism. The french guerilla group "Action Directe" (1979-1986) was in a way a influenced by the GP ("AD" is a fusion of spanish anti-franquist groups, anarchists groups and autonoms. Their ideology always was council communism). Another maoist group from the 1970's, called "Vive la révolution!" (long live the revolution), produced the paper "Ce que nous voulons : TOUT!" (what whe want : everything!) and produced the gay and lesbian liberation movement. The maoists, called also "mao spontex" (spontaneist maoists, spontex is a mark for a spoon in France), were really far from the marxists-leninists, that considered the GP as petit-bourgeois. 5.Has the CP(MLM) a connection to the RIM? We think it is correct that all the MLM parties work together, get some connection, etc. But the RIM upholds that people's war is not universal; for some of the parties in it (like the MKP from Turkey) revolution in capitalist countries is impossible. We don't think we have to wait for the revolution in the oppressed countries or to wait for a huge imperialist war to make an insurrection. However we uphold the global resistance that existed in Europe in the 1970's-1980's (like the autonom movement in Germany); for the RIM, in a classical "ML" tradition, it has no interest. The RIM was never interested in Europe. Yes, Stalin was us a communist. 7.What do you think about post-stalin USSR and post-mao China? We think that the USSR was a social-imperialism and that China is today and since the breaking of the revolutionnaires known as "the gang of four" a capitalist fascist state. 8.Do you recognize Euzkadi, Corsica and Brittany as nations? Yes, we consider that they are oppressed nations and that the duty of communists of France is to help theirs national liberation movements. 9.Are there some parties in the world that you uphold particularly? The CP(MLM) could have not exist without the example of the Communist Party of Peru founded by Chairman Gonzalo. Gonzalo first developped the thesis that people's war was universal. The CP of Peru has open the way to take Marxism- Leninism- Maoism as a whole (what the "proletarian left" was not able to). The CP(MLM) could not have exist without the example of the TKP(ML), the Communist Party of Turkey (Marxist-Leninist), and TIKKO (the workers and peasants army of liberation of Turkey). There are a lot of immigrants and refugees from Turkey and Kurdistan in France. They brought with them the best that they had: the concept of the party founded by Ibrahim Kaypakkaya. We try to follow here in France the way opened by BARBARA KISTLER, the swiss comrade that died at the age of 37 in 1993 in the ranks of TIKKO. 10.Do you really think you're gonna make the revolution in France?